Impressions and Add to Cart - what it means and how should it be interpreted? Impressions is a key metric to define 'visibility' - the closest tangible metric to show how often is your work seen by others. This basically means every time an artwork is seen (excluding being viewed on it's on page) - it makes an impression. High Impression numbers means your artwork is appearing in feeds and searches and is visible to collectors. What if Impressions are high but views are low? - If your Impression numbers are high and artwork views are low, this means the artwork is appearing in the search but not being clicked on. The usual ratio is quite low (even for popular/well known artists, who upload works almost every day or few times a week and is around 1:100). That means for every 100 impressions, it's viewed once. It's nothing to worry about as people like to search with a wide range of factors (colour, size, media etc.). Have well photographed images: Good lighting, good cropping, and most importantly keep the main image as the full image of the artwork. If you're putting 'in situ' image as the main image, in the tile format it looks even smaller and might get a miss instead of a click even when it's relevant. Tag with relevant keywords: This is important for accuracy. If someone is trying to find a 'zebra' piece and roses are coming up, they'll get impressions but not views. Dimensions check: Check, double check and triple check if the dimensions for the artwork are correct and accurate. If someone is searching for a large piece, and you've accidentally entered 300(mm) instead of 30cm, you'll get an impression but not a view. They're shortlisting artworks (from the one's they've already favourited) - A lot of collectors go through 100s of artworks before they come to a decision. Which means they go through various stages of shortlisting and decision making. Adding things to cart is usually the last stage of shortlisting. You add things to cart, see how much the whole thing costs and make your final decision. This means that unfortunately not all 'Add to Cart's will convert into a sale - but that's not a bad thing. Each Add to Cart gives you popularity points meaning your artwork is pushed up the 'Popular Artworks' page. They want to see information around shipping, returns and total payments - New collectors (new on Bluethumb), who're not familiar with shipping and return policies, sometime add things to cart and go to checkout (order page) to see the order details. They also do this to see the payment options available and make decisions accordingly. Collectors who don't prefer creating an account (due to various reasons) use 'Add to cart' instead of 'favouriting' your artworks as a shortlisting method. What happens when someone adds something to cart? Others can still/also add it to cart and buy. Adding an artwork to cart doesn't put it on hold or makes it unavailable. If they add something to cart and don't buy it, Bluethumb sends them 3 emails (over the period a week) to remind them and see if they have any concerns (shipping, returns, payments etc.) These emails are well designed to address the major/common concerns and give the buyers the confidence to buy. 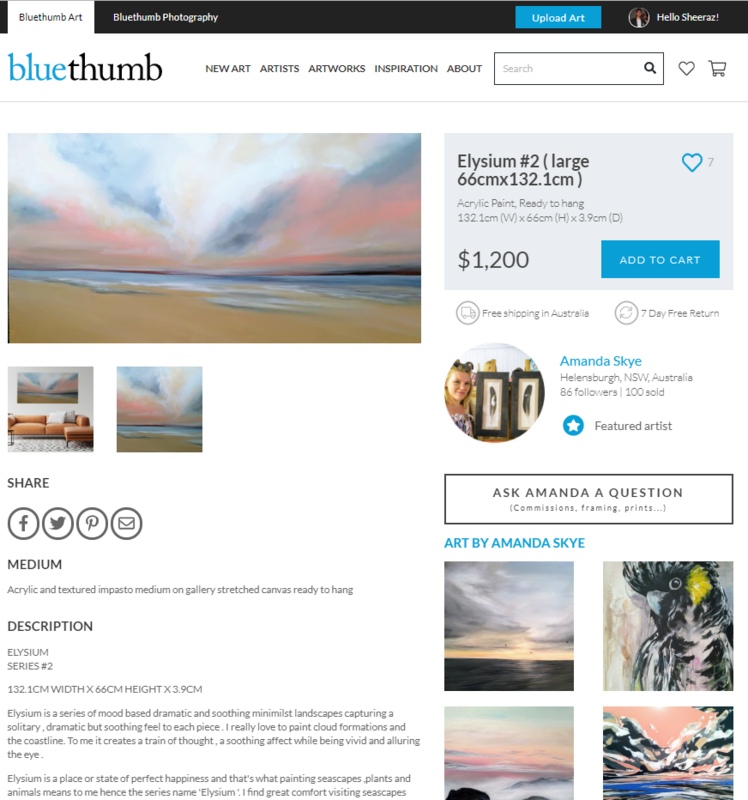 If they still haven't responded or purchased it, Bluethumb's sales team personally reaches out to them and see if we can help/assist them with anything at all. This is usually done over a call. We have to walk the fine line of not annoying people but also subtly telling them that we're here if they'd like to talk (we try to not be pushy - it's a good experience). At this time the artists can't see which artwork has been added to cart (and how many times) but this will be available in near future with a more detailed dashboard. We have covered what Impressions and Add to carts mean in our introductory articles - Understanding your new artist dashboard.